Spring has finally arrived here in Richmond! With the return of the warm weather it’s time to get outside and get started on those home maintenance projects that you had to put off during the cold months. One of the many spring home maintenance activities you can do this spring is fence maintenance! The winter can take its toll on fencing, with snow, ice, and cold temperatures. In this week’s blog, we’ll talk about some basic spring fence maintenance you can perform to ensure your fence is in good shape. First things first, inspect the fence for any signs of damage. Look for rust, chipping or peeling paint, damaged boards or posts, damaged latches, shifted posts, or anything else out of the ordinary. This way you can make a list in your head of anything that needs to be done. It’s likely that your fence has accumulated some dirt and debris over the course of the winter. Now is the perfect time to give your fence a nice cleaning. You can read our blog on how to clean a wood fence for more information about wood fence cleaning, with tips on removing mildew and moss. For other types of fencing such as vinyl, aluminum, or iron, a mild detergent in warm water should suffice. Make sure to rinse the soap off the fence after you’re finished. If you have a wood fence, spring is also a great time for sealing, staining, and painting your fence. Sealing the fence helps protect it from moisture damage, and staining and painting can give it a new color and aesthetic for a new year. Learn more in our blogs. Another good thing to do in the spring is prune back any limbs or vegetation that’s too close to the fence. Limbs can break off and fall and potentially damage the fence. 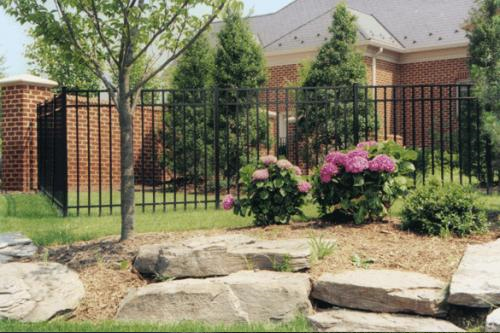 If vegetation is left alone, it can grow around then fence and weaken it structurally. You should also remove any debris that has accumulated at the base of the fence over the winter. This is because debris holds moisture, and this makes the earth at the base of the fence damp and loose. If the posts aren’t set deep enough, they can shift in the loose earth, damaging the fence. This entry was posted on Thursday, March 26th, 2015 at 3:23 pm. Both comments and pings are currently closed.